What they are: Microlink extensions are also another popular method. They are individual strands of hair that are applied to your own hair in 1cm sections. They are held in place with a shell, bead, tube, or link. The best ones are silicone lined to prevent damage to your hair. The link is slid onto your hair then a pre tipped individual strand of hair is inserted into the link. It is then clamped shut to secure the extensions (using a special tool, I do not use plain old pliers!). Who they are for: Microlink extensions are for women who still take care of their hair but want something more natural than track n sew. Microlinks should be a first step before doing fusion extensions in most cases, but the second step after track and sew. 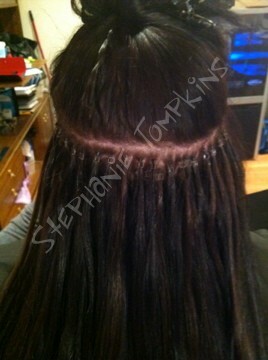 Type of hair needed: Microlinks are individual strands of hair that are pre-tipped with glue for closure only. Unlike fusions the tips are very thin/tiny to be able to fit in the beads. They can not be fused to your hair. They are also sold in bunches. Kind of hair: The best hair is called Remy hair. Remy is not a brand itself, it is just a type of hair. Remy means the cuticles are pointed in the same direction. This is the healthiest hair, it lasts longer, and reduces tangles. So you can choose any type of brand you want but you want to make sure it is "100% human remy hair". Expect a higher cost, usually that means it is better hair. Remy hair should not be cheap. Installation: Installation time takes about 1.5 hours to 2 hours. Installation includes unlimited pieces. Price is a flat rate wether you have 100 or 200 pieces. Installation also includes a flatiron and any cutting/blending needed for a natural look. Every installation gets a take home care sheet as well if needed. These extensions can be tightened every 4 weeks. Cost: I charge $2 per piece for install. The average cost is $200 for installation. $1 per piece or average $100 for tightening. $40 for removal. Cost of hair varies. The cost depends on the length you want and the quality you want. The brand for microlinks is called "French Kiss" there is also a new brand called "Le Prive" too. Price is close to $100 per pack. You can purchase beads from me at $5 per 50 regular beads or $20 per 100 silicone beads. If you pick them up yourself, Images and Shades sells the silicone lined ones at $50 for 200. Risks: These extensions do not damage your hair. Damage occurs from poor maintenance, styling tools, and excess pulling of the hair. Consistent scratching can create bumps/pimples and/or sores/scabs. You must brush your hair at the scalp. If matting occurs here the extensions should be taken out, brushed out, and then replaced asap. If tightening is left to long, brushes may catch the beads and rip them out with your hair or matting can become worse. Side Effects: When being installed there is a slight pulling, baby hairs sometimes get caught and therefore sometimes there is also a little bit of pulling of those too. Headaches are normal the first day and sleep for the first couples days will be uncomfortable until they loosen up. It is suggested you take an advil before your appointment and again before bed. However the pain it nothing! Its mostly from the weight of the hair and fresh install. Length they last: On average these extensions last 3-6+ months. Tightening can be done every 4 weeks and as long as the hair is taken care of they can continuously be retightened. These are the longest lasting extensions. But how long they last still depends on how fast your hair grows and how well you take care of them. If they start to matt your safest bet is to redo them, they can't be tightened if there is a matt. Maintenance: Use your leave in conditioner and serum everyday! Serum will help reduce tangles dont be shy. Leave in conditioner helps with brushing so you are not snapping hairs that will eventually matt up. You must brush the hair at your scalp, sections are always a good thing. A loop brush is highly suggested. I do sell loop brushes. You should also wrap your hair every night for best results. Removal: Removal is easy. My tool goes in through the top and the bottom of the bead and opens it up from the inside letting the hair slide out. Even though they slide right off there is still sometimes a little bit of pulling here and there. Removal can take around 30-45 minutes. Removal is half price if a new install is done the same day. Remember that everyday we shed naturally 50-100 hairs. When you have a link, the hair that has shed is still caught in that link. When your extensions are taken out you will lose hair. This is only your natural shed that has already fallen off. There will be very little, but there is still a bit. It is completely normal. Why you should get them: Because they are the longest lasting method. They are also very popular and most girls find it safer than fusions. They are undetectable if blended properly. They can add highlights or lowlights instantly. They add beautiful lengths and volume. They can last a very long time with the proper care and maintenance.